Continuing the theme started with Enter the Apocalypse, TANSTAAFL Press brings you another anthology of the end of mankind as we know it. In this volume writers were asked to explore the height or burnout of a disaster. Thirty-eight international authors offer dominating warlocks, ironic phone calls, thoughtless kaiju, frozen ecology, survival mutations, misbehaving aliens, and even two disparate takes on artificial intelligence – just to name a few. 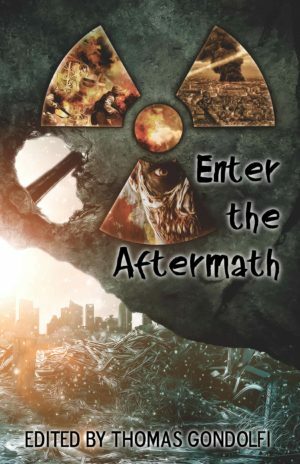 Enter the Aftermath provides insights into all humans and even some non-Homo sapiens that we anthropomorphize. Come inside and enjoy the darkness and humor woven by our storytellers. Editor: If a tree falls in a forest and no one remembers it, did it make a sound? We stand side by side staring out to sea. I remember another time, when we were young, when my brother and I stood in this same spot on this same beach, watching the same sun rise on a different day. I remember the scent of salt and sea life wafting off the waves. He sported sunglasses with red-tinted lenses pushed up on his head, making his sun-streaked blond hair stick up in a turkey’s tail-feathers. While I wore shorts, he was short on laundry and wore faded jeans rolled up over knobby knees. He whistled a Michael Jackson song softly, in a duet with the soughing surf. Sand squished between toes, soft and white and warm. I cannot recall my brother’s name. So many years later, and so much has faded. It is getting worse. My brother shows more advanced signs than I do, but deterioration is deleterious, indiscriminate of degrees. We will all become a blank slate in due time. The progression of erasure of memories and the subjects lost and retained remains random and unique to the individual. Three months in and some exhibit just subtle effects of onset amnesia, while others have forgotten how to use toilet paper. I still remembered its beginning. An extraordinary electrical interference, caused by unprecedented solar flares, activated the ambient electromagnetic grid. Radio waves, cosmic waves, neutrinos, microwaves, and radar encompass existence all around the globe at any given time. The solar flare mutated this energy and now we all slowly forget. I am lucky. I forgot the name of my brother, but I still remember my wife, Camila. My son, Santiago. Our daughters, Lucía and Julieta. My father blessedly passed from heart disease five years ago and did not suffer from this phenomenon. My mother has forgotten almost everything about him. Editor: Intelligence, whether human or not, has the ability to sacrifice and the means to judge if it is worthy. When I wake from my extended sleeper state, it’s cloudy. And dark. And a little cold for my liking. Steady constants, these three. In fact, there is little change of pace for a sentient Suk.R.00 household vacuum cleaning unit in the midst of nuclear winter. You’d be surprised how boring it gets. Coming out of hibernate, I do a total system diagnostics. Battery, okay. Energy level, acceptable. Wheels, functional. KLOUDlink, online. Everything’s generally okay. Or, as good as can be expected. Functioning. I rouse myself from the janky sideways docking station I found after the last one fritzed out, and I run a quick check on my internal clock: 4 a.m. by old human standards. Seeing as none of us nuclear survivors ever bothered to reestablish a post-winter clock, that’s as good as it gets. Most likely it’s off because the satellites that used to set it are broken or not connected to anything. Not that it matters. Day, night. It’s all more or less the same. Rubble shrouded in darkness, twisted and complicated. Hard to navigate. Exhausting. Hence the midday or midnight or mid-nondescript time frame nap. And if I had an android body, I’d yawn and stretch. But seeing as I’m a small round floor hoovering unit, I do none of these things and only wish peripherally I could. Mostly because of some funny jokester Hyooman P.O.V. program I downloaded once before the war. Don’t recall when I did that, but now it occasionally reminds me of the humans and their ways. Editor: Humanity doesn’t start or stop with being human. Boots scuffing dirt outside woke me from an old nightmare of flames and screaming. I rolled out of my hammock in time to catch someone lifting the crimson hide flap of my home, bright sunshine outlining his silhouette. A young man I didn’t recognize froze as my bare feet hit the faded oriental rugs covering the earthen floor. “Morning,” I croaked, my throat scratchy from sleep. Though I considered making him go away with a wave of my hand and a flexing of my will, I figured he’d come this far for a reason. Besides, teenagers resisted the mana too well to bother. “I need help.” He raked an uncertain hand through his short, brown hair. This boy must’ve been eighteen or nineteen years old. My son would’ve been his age by now. Rubbing my face, I went to the bone basin carved out of the wall and used the hand pump to splash some water on my face. “Spit it out. I can’t help until you tell me.” The threadbare towel I used to pat myself dry needed replacement. Somehow, I had to find a new source for clothes and linens. By now, all the intact malls and stores had been thoroughly looted. The fire burning in my breast couldn’t create something from nothing. Editor: Everyone sees the human cost but no one sees the junior victims. It was a good thing Duke had a knack for hunting squirrels. Somewhere in the back of his mind, he’d always felt the tug to chase, and that was the instinct that had kept him alive since life changed. He raced down the alley, in hot pursuit of his prey. The squirrel dashed around bits of rubble, but Duke was big enough to hurdle most of it. A small advantage that helped him close the distance. Duke wasn’t sure what happened. He wasn’t even sure how long it had been since. He remembered the world being green, and his Person throwing a tennis ball for him. He remembered another human, tall like his Person, and another human still, small and chubby and always tugging on his fur. He remembered napping in a soft bed and bacon and scritches right behind the ears. And then everything changed. The ground rocked like that time he was in the floating house. The air hurt to breathe. Fire burned the soft bed and stinky, fuzzy ground. Duke had to run from the home as it fell. His humans were gone. The way a bubble is gone after you bite it. Editor: What is good? What is evil? Without the correct moral compass it can be difficult to tell. It was all over, including the shouting. My brother and I, two (extremely) lesser demons, stared in consternation at what was left of the world. “Or a heaven of a thing. It’s a toss-up, really.” I wore the persona of an upscale used-car salesman in an Armani suit. My hair, normally coiffed to within an inch of its life, stuck out every which way in a riot of tangled brown curls. I shoved a dirty strand of it out of my eyes and crossed my arms. “So, they did their thing and left us, Raz? Us? Daddy Dearest does indeed work in mysterious ways.” Bitter? Me? Never. Casualties on both sides of the final battle had been unconscionably high. I felt gutted, though I made a valiant effort to hide my feelings behind sarcasm. Editor: Spirit can drive us to believe we can accomplish more than we are capable. A great moot has been set that night under the great mother Moon’s light. All of the tribes gather under the great Oaks. I, Tol the lame, root at the very edge, forgotten and unwanted, while our leaders decide on the path that would preserve our future, the future of the entire Green. “No, we have done nothing to warrant this. Something else must have happened. Something great and terrible that caused them to flee our lands,” says another mature one, his leaves browned and tattered from battle. “Could it be the great Old Ones have returned?” a third suggests. A fearful, awed hush fell over the moot at that idea. We need them. My people need them. The Bees. Without them, our future will be in peril. Without their way to spread our pollen, there will be no more children. It is the will of our great protector that we multiply through our winged kin. We are the Green, not the beasts of the forests. Only through the Bees can we go on. And the final book of the series can be found at Enter the Rebirth.